From road trips to busy mornings and everything in between, a grab-n-go snack doesn’t always live up to the ethical and eco-friendly standards we might hope it would. Whether it’s made with 50+ mystery ingredients, wrapped in wasteful packaging, or made in an environment that puts its workers at risk, there’s a lot more going on in that granola bar than just a quick midday fix. Become a more conscious nibbler by filling up on foods that don’t just do good—they do great. As you may already know, eating ethically doesn’t only mean buying organic produce at the store but supporting creative and innovative brands that are changing the industry and beyond. Hey, if the only thing you have to do is buy a box of delicious granola bars then we really can’t think of a way to make this any better. Check out our list of the 11 best sustainable snacks that you can feel good about eating when you’re on the go! One of the pioneers of total transparency in the sustainable snacking industry, Quinn Snacks is dedicated to making their Farm-to-Bag ethos more than just a tagline. Whether they are winning awards for being some of the cleanest packaged foods or providing you in-depth descriptions of where your snacks came from, this brand delivers on all fronts. Try some of their organic, GMO-free and Fair Trade eats like microwave popcorn with real butter, pretzels, and deliciously popped popcorn. 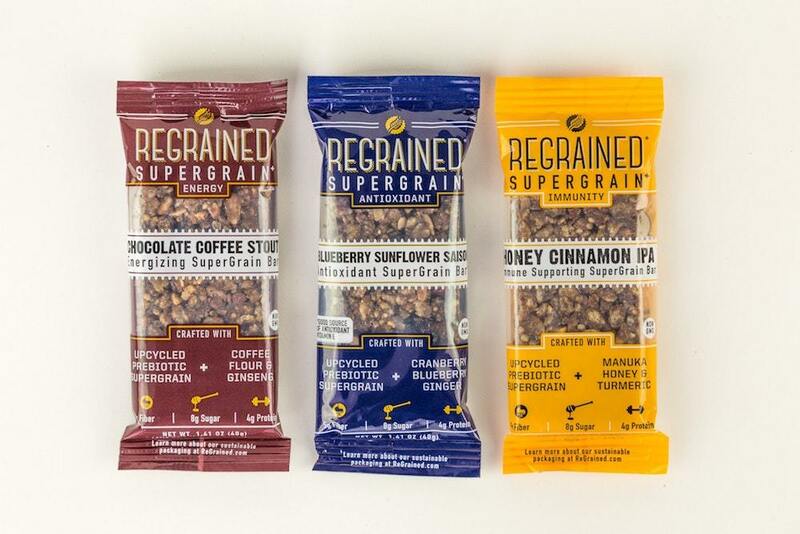 The clever folks behind Regrained create tasty snack bars from upcycled grains that are leftover from the beer brewing process. With cheeky flavors like Honey Cinnamon IPA and Chocolate Coffee Stout, they wrap each nutritious bar in an innovative, compostable wrapper. The amount of research and science that Regrained packs into every product is pretty mind-blowing. Show this brand some love and grab a few bars for your next road trip! Made in Boulder, Colorado with love, Bobo's baked oat bars are also made with clean and simple organic ingredients that are GMO-free. It’s a family-owned and operated small business that bakes a variety of flavors while staying true to their original recipe (they've also recently added toaster pastries to their product lineup). Plus, Bobo's donates to local housing projects in Colorado to help ensure those in need have safe homes. Every time you buy a snack bar from This Bar Saves Lives, a child suffering from malnutrition in a developing country is able to receive life-saving food. The simple and straightforward mission of This Bar Saves Lives uses tasty, organic fruit and nut bars to supply the nutrition to children in need—they've helped over 6,500 children to date. You can even subscribe to get their bars regularly for a 10% discount! Co-founded by Hollywood actors like Kristen Bell, this is one snack we will happily pack in our lunches. Combating both food waste and hunger, Barnana takes too-ripe or bruised bananas (re: perfectly good) that would typically be discarded and turns them into nutrient-rich bite-sized snacks. The company was founded by a professional triathlete from Latin America who saw that the food industry’s approach to throwing away “ugly” bananas was certainly ripe for change. Today, Barnana offers a wide variety of chewy banana snacks, plantain chips and even banana brittle for conscious snackers to enjoy. Ever the eco-trail blazers, the folks at Patagonia have added sustainable snacks to their long list of excellent and ethical products. Patagonia Provisions offers everything from environmentally-friendly breakfast foods to soups to salmon and more! Grab one of their organic fruit and almond bars for when you’re on the go or stock up on their dry soups and chilis for quick weeknight meals—or on your next outdoor adventure. Made from organic and ethically-sourced ingredients, they check off all the boxes: nutritious, delicious and world-changing. Every product made by Alter Eco is sourced from farmer-run cooperatives that practice sustainable agriculture. What’s even better is that their snacks come in compostable packaging so you can enjoy a 100% sustainable treat. Alter Eco has taken their ethics a step further by creating a closed-loop system in which they work with their growers to replant the cacao plants used to make their products. Did I mention they’re Frenchmen who make chocolates? You’re welcome. Indulging never felt so good with Project7’s naturally-flavored gummies, candies and chewing gum. Besides packing their sweet treats with certified organic, non-GMO, Fair Trade, preservative-free (yes, the list does go on) ingredients, the company focuses on giving back in 7 areas of need: clean water, tree plantings, homelessness, feeding the hungry, anti-bullying programs, malaria treatments and education. Permission to buy an extra bag of gummy bears, granted. You’ve probably seen Nature's Path—and their sister brands, Love Crunch, EnviroKidz and Qi’a—on the shelves of most food stores before, which is great news for sustainable snackers who can’t make a separate trip to the health food store. The certified organic, GMO-free and Fair Trade ingredients of this independently-owned brand is also made in a zero-waste facility so their impact (or lack thereof) goes above and beyond. Plus, you can recycle much of the packaging that their yummy products come in, even things like plastic cereal bags and boxes, to help you seriously reduce the waste. Another popular brand that is on the shelves of many big box food stores, Back To Nature offers a wide variety of organic snacks that are certified organic and free from GMOs. Their simple everyday snacks range from healthy breakfasts and crackers to our favorite classic sweet treats and cookies that we love bringing along for lunches at work or on the go. Whether it’s cookies, crackers or granola bars this is a brand you don’t have to think twice about grabbing on the go.